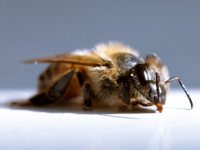 Research in the Nieh lab focuses on how natural and man-made stressors affect the biology of and cognitively sophisticated behaviors exhibited by bees. Our research focuses on two areas: (1) the selective pressures that may have shaped the evolution of communication in highly social bees and (2) honey bee health. We use the tools of Behavioral Ecology, Chemical Ecology, Animal Communication and Neuroethology to work with bumble bees, stingless bees, and honey bees. Five different topic areas are detailed below. For further information, please view the Nieh Lab Homepage. Selective pressures from competitors and predators has shaped social bee communication. Our lab studies multiple bee groups: honey bees, stingless bees, and bumble bees to learn how this communication works and why it may have evolved. Concern is growing over pollinator declines. Our lab examines the effects of natural stressors, such as pathogens, and man-made stressors, such as pesticides, on honey bee health, foraging, flight, and orientation. What happens if conditions change and the communicated food source becomes depleted, contested, or dangerous? The honey bee stop signal provides inhibition that counteracts the positive feedback of honey bee waggle dances. Using field studies and modeling, we are studying this signal in detail and exploring conditions under which inhibitory signals may evolve. We study olfactory eavesdropping in stingless bees and honey bees and examine the advantages of eavesdropping upon competitors and predators. Despite their small brain size and limited number of neurons relative to the central nervous systems of many vertebrates, social insects have evolved sophisticated learning and memory abilities and are therefore important models for animal cognition. However, these abilities can be impaired by field-realistic exposure to pesticides and other man-made stressors. Dong S., Tan K., Zhang Q., and Nieh J.C. (2019) Playbacks of Asian honey bee stop signals demonstrate referential inhibitory communication. Animal Behaviour. 148: 29-37. Kheradmand, B., Cassano J., Gray, S., and Nieh, J. C. (2018). 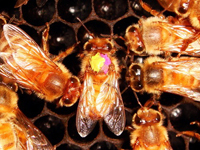 Influence of visual targets and landmarks on honey bee foraging and waggle dancing. Insect Science. 00, 1–12, DOI 10.1111/1744-7917.12651. Dong, S., Wen, P., Zhang, Q., Wang, Y., Cheng, Y., Tan, K., and Nieh, J. C. (2018) Olfactory eavesdropping of predator alarm pheromone by sympatric but not allopatric prey. Animal Behaviour. 141: 115-125. Tosi, S., Nieh, J. C., Sgolastra, F., Cabbri R., and Medrzycki, P. (2017) Neonicotinoid pesticides and nutritional stress synergistically reduce survival in honey bees. Proceedings of the Royal Society B. 284. 20171711. Tan, K., Wang, C., Dong, S., Li, X., and Nieh, J.C. (2017) The pesticide flupyradifurone impairs olfactory learning in Asian honey bees (Apis cerana) exposed as larvae or as adults. Scientific Reports 7:17772: DOI:10.1038/s41598-017-18060-z. Ping Wen, Yanan Cheng, Yufeng Qu, Hongxia Zhang, Jianjun Li, Heather Bell, Ken Tan, and Nieh, J.C. (2017) Foragers of sympatric Asian honey bee species intercept competitor signals by avoiding benzyl acetate from Apis cerana alarm pheromone. Scientific Reports. DOI:10.1038/s41598-017-03806-6. Huey, S., and Nieh, J. C. (accepted) Foraging at a safe distance: crab spider effects on pollinators. Ecological Entomology. Ya-nan Cheng, Wen Ping, Shi-hao Dong, Ken Tan, Nieh, J.C. (2017) Poison and alarm: The Asian hornet Vespa velutina uses sting venom volatiles as an alarm pheromone. Journal of Experimental Biology. 220: 645-651. Gong, Z, Wang, C., Nieh, J.C., and Tan, K. (2016) Inhibiting DNA methylation alters olfactory learning extinction but not acquisition in Apis cerana and Apis mellifera. Journal of Insect Physiology. 90:43-49. Wang, Z., Wen, P., Yufeng, Q., Dong, S., Li, J. Tan, K., and Nieh, J.C. (2016) Bees eavesdrop upon informative and persistent signal compounds in alarm pheromones. Scientific Reports. 6: 25693 EP. Lau, P. and Nieh J.C. (2016) Salt preferences of honey bee water foragers. Journal of Experimental Biology 219: 790-796. Zhang, E. and Nieh, J.C. (2015) A neonicotinoid, imidacloprid, impairs honey bee aversive learning of simulated predation. Journal of Experimental Biology 218 3199-3205. 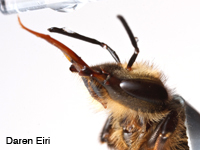 Eiri, D., Endler, M., Suwannapong, G., and Nieh, J.C. (2015) Nosema ceranae can infect honey bee larvae and reduce subsequent adult longevity.PLOS One. DOI:10.1371/journal.pone.0126330. Tan, K., Chen, W., Dong, S., Liu, X., Wang, Y., and Nieh. 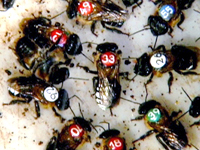 J.C. (2014) Imidacloprid alters foraging and increases risky behavior in bees. PLOS One 9(7): e102725. Bray, A. and Nieh, J. C. (2014) Non-consumptive predator effects shape honey bee foraging and recruitment dancing. PLOS One 9(1) e87459. Sánchez, D., Nieh, J. C., and Vandame, R. (2011) Visual and chemical cues provide redundant information in the multimodal recruitment system of the stingless bee Scaptotrigona mexicana (Apidae, Meliponini). Insectes Sociaux, in press. Lichtenberg, E.M., Hrncir, M., and Nieh, J.C. (2011) Optimal eavesdropping by foraging stingless bees: empirical and theoretical support. Behavioral Ecol. Sociobiol. 65: 763-774. Sadler, N. and Nieh, J. C. (2011) Honey bee forager thoracic temperature is tuned to broad scale differences in recruitment motivation. J. Exper. Biol.. 214: 469-475. Johnson, B.R., Nieh, J.C. (2010) Modeling the adaptive role of negative signaling in honey bee intraspecific competition. J. Insect Behavior. 23: 459-471. Ramírez, S.R., Nieh, J. C., Quental, T.B., Roubik, D.W., Imperatriz-Fonseca, V.L., and Pierce, N.E. (2010) Molecular phylogeny of the stingless bee genus Melipona (Hymenoptera: Apidae) and the evolution of recruitment communication in eusocial Apidae. Mol. Phylogenetic Evolution. 56: 519-525. Nieh, J. C. (2010) A negative feedback signal that is triggered by peril curbs honey bee recruitment. Curr. Biol. 20: 310-315. Lau, C.W. & Nieh, J.C. (2010) Honey bee stop signal production under overcrowded feeder conditions. Apidologie 41: 87-95. Lichtenberg, E.M., Imperatriz-Fonseca†, V.L., and Nieh, J.C. (2010) Behavioral suites mediate group-level foraging dynamics in communities of tropical stingless bees. Insectes Sociaux 57: 105-113. Sánchez, D., Nieh, J.C., León, A., & Vandame, R. (2009) Food recruitment information can spatially redirect employed stingless bee foragers. Ethology.115: 1175-1181. Toda, N., Song, J., & Nieh, J.C. (2009) Bumble bees exhibit the memory spacing effect. Naturwissenschaften. 96: 1185-1191. 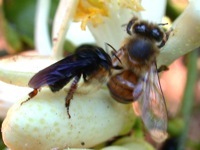 Kuhn-Neto, B., Contrera, F.A.L., Castro, M.S., & Nieh, J.C. (2009) Long distance foraging and recruitment by a stingless bee, Melipona mandacaia. Apidologie. 40: 472-480. Lichtenberg, E.M., Hrncir, M., & Nieh, J.C. (2009) A scientific note: Foragers deposit attractive scent marks in a stingless bee that does not communicate food location. Apidologie. 40: 1-2. Kitaoka, T.K. & Nieh, J.C. (2009) Bumble bee pollen foraging regulation: role of pollen quality, storage levels, and odor. Behavioral Ecology and Sociobiology. 63: 501-510. Renner, M.A. & Nieh, J.C. (2008) Bumble bee olfactory information flow and contact-based foraging activation. Insectes Sociaux 55: 417-424. Mapalad, K. S., Leu, D. & Nieh, J. C. (2008). Bumble bees heat up for high quality pollen. Journal of Experimental Biology, 211:2239-2242. Eckles M. A., Wilson E. E., Holway D. A., and Nieh, J. C. (2008) Yellowjackets (Vespula pensylvanica) thermoregulate in response to changes in protein concentration. Naturwissenschaften. 95: 787-792. Nieh, J. C. & Sánchez, D. (2005) Effect of food quality, distance, and height on thoracic temperature in the stingless bee, Melipona panamica. Journal of Experimental Biology 208:3933-3943. Saraiva, A. M., Nieh, J. C., Cartolano Jr., E. A. (2005) EthoLog: a tool for data acquisition in behavioral studies. 2005 EFITA/WCCA Joint Congress on Information Technology in Agriculture. 1, 1-7. Nieh, J. C., Kruizinga, K., Contrera, F. A. L., Barreto, L. S. & Imperatriz-Fonseca, V. L. (2005) Effect of group size on the aggression strategy of an extirpating stingless bee, Trigona spinipes. Insectes Sociaux. 52, 1-8. Nieh, J. C., Contrera, F. A. L., Yoon, R. R., Barreto, L. S., & Imperatriz-Fonseca, V. L. (2004) Polarized short odor-trail recruitment communication by a stingless bee, Trigona spinipes. Behavioral Ecology and Sociobiology, 56, 435-448. Nieh, J. C., Barreto, L. S., Contrera, F. A. L. & Imperatriz-Fonseca, V. L. (2004) Olfactory eavesdropping by a competitively foraging stingless bee, Trigona spinipes. Proceedings of the Royal Society of London B, 271, 1633-1640. Sánchez, D., Nieh, J. C., Hénaut, Y., Cruz, L., & Vandame, R. (2004) High precision during food recruitment of experienced (reactivated) foragers in the stingless bee Scaptotrigona mexicana (Apidae, Meliponini). Naturwissenschaften. 91, 346-349. Nieh, J. C., Contrera, F. A. L. & Nogueira-Neto, P. (2003) Pulsed mass-recruitment by a stingless bee, Trigona hyalinata. Proceedings of the Royal Society of London B, 270, 2191-2196. Nieh, J. C., Contrera, F. A. L., Ramírez, S. & Imperatriz-Fonseca, V. L. (2003) Variation in the ability to communicate 3-D resource location by stingless bees from different habitats. Animal Behaviour, 66, 1129-1139. Nieh, J. C., Contrera, F. A. L., Rangel, J. & Imperatriz-Fonseca, V. L. (2003) Effect of food location and quality on recruitment sounds and success in two stingless bees, Melipona mandacaia and Melipona bicolor. Behavioral Ecology and Sociobiology, 55, 87-94. Nieh, J. C., Ramírez, S. & Nogueira-Neto, P. (2003) Multi-source odor-marking of food by a stingless bee, Melipona mandacaia. Behavioral Ecology and Sociobiology, 54, 578-586. Nieh, J. C. & Tautz, J. (2000) Behavior-locked signal analysis reveals weak 200-300 Hz comb vibrations during the honeybee waggle dance. Journal of Experimental Biology, 203, 1573-1579. Nieh, J. C., Tautz, J., Spaethe, J. & Bartareau, T. (2000) The communication of food location by a primitive stingless bee, Trigona carbonaria. Zoology, 102, 239-246. Nieh, J. C. (1999) Stingless-bee communication. American Scientist, 87, 428-435. Nieh, J. C. & Roubik, D. W. (1998) Potential mechanisms for the communication of height and distance by a stingless bee, Melipona panamica. Behavioral Ecology and Sociobiology, 43, 387-399. Nieh, J. C. (1998) The food recruitment dance of the stingless bee, Melipona panamica. Behavioral Ecology and Sociobiology, 43, 133-145. Nieh, J. C. (1998) The honey bee shaking signal: function and design of a modulatory communication signal. Behavioral Ecology and Sociobiology, 42, 23-36. Nieh, J. C. (1998) The role of a scent beacon in the communication of food location in the stingless bee, Melipona panamica. Behavioral Ecology and Sociobiology, 43, 47-58. Nieh, J. C. & Roubik, D. W. (1995) A stingless bee (Melipona panamica) indicates food location without using a scent trail. Behavioral Ecology and Sociobiology, 37, 63-70. Nieh, J. C. (1993) The stop signal of honey bees: Reconsidering its message. Behavioral Ecology and Sociobiology, 33, 51-56. Runestad, J. A., Ruff, C. B., Nieh, J. C., Thorington, R. W., Jr. & Teaford, M. F. (1993) Radiographic estimation of long bone cross-sectional geometric properties. American Journal of Physical Anthropology, 90, 207-213. Allmon, W. D., Nieh, J. C. & Norris, R. D. (1990) Drilling and peeling of turreteline gastropods since the Late Cretaceous. Palaeontology, 33, 595-611. Dr. Nieh received his BA from Harvard in 1991 and his Ph.D. from Cornell University in 1997. He completed a NSF-NATO postdoctoral fellowship at the University of Würzburg, Germany and was a Harvard Junior Fellow from 1998-2000.